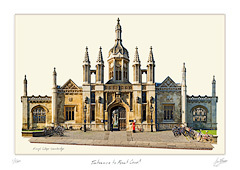 The King's College of Our Lady and Saint Nicholas in Cambridge was founded in 1441 by King Henry VI, who laid the first stone on Passion Sunday 1441. 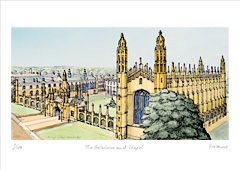 It was specifically for boys from Eton College and it was not until 1865 that the first non Etonian undergraduates arrived to study at King's. Henry drew up detailed instructions for the construction of a 'great court' but only the Chapel was ever completed. The next major addition to the College's present site was the Gibbs' building, begun in 1724 and named after its architect. The building was part of a more elaborate scheme which was originally planned to include two more similar buildings on the south and east sides of the front court. It was over a hundred years later that the architect William Wilkins designed the neo Gothic south range and the delicate stone screen and gatehouse, after winning a competition held by the college. This range, with the Porters' Lodge in the Gatehouse, separates the college from King’s Parade.